Best Toronto Stucco Homes wants you to feel secure in your decision to invest in an acrylic stucco system for your home or commercial building. For this reason, we offer warranties to cover both material defects and workmanship. If any issue should arise, simply contact us and one of our skilled professionals will visit your home or commercial building and make the proper recommendations for a quick repair. All exterior products sold by Best Toronto Stucco Homes for use as an enhancing coating material, as described by us to you, shall be defect free in both the manufacturing and application processes. This warranty extends to any future owner of a home or commercial building during the stated warranty period. 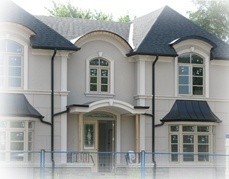 Best Toronto Stucco Homes warrants all materials for a period of 25 years and all workmanship for a period of 5 years. It is the owner's responsibility to properly maintain the stucco application. Failure to do so may result in a voidance of the warranty. Note: A Condition of this warranty is the proper flashing and weeping of all windows, doors, and other wall penetrations. This must be completed to prevent water from getting behind the exterior coatings. Any and all further construction on the home or commercial building must conform to local building codes. Outside contractors must comply with solid building practices which prevent water from seeping into the wall cavity. Best Toronto Stucco Homes will not be held responsible for any water damage- including fungus, insect, or mold infestations caused as a result of leaky doors, windows, or other wall penetrations. Any incidental or consequential damages are not covered by this warranty and cannot be recovered. What will Best Toronto Stucco Homes do? We will replace and materials found to be defective and provide the labor to repair the issue. As a precaution, place all receipts, contracts, and invoices in a safe place. These may be required for warranty work. Contact us within 30 days of noticing the problem and describe the issue so we can make the proper arrangements for examination/repair. What is the required maintenance of my new system? Aside from general maintenance- including periodic washing, you should examine the exterior from time to time to ensure no penetration of moisture has been made. any medium or in any manner other than stated herein without the written permission of Best Toronto Stucco Homes.